The Bride & Groom Nigel and Gillian Oliver, Thursday 4th September 2008, Newick Park, nr Lewes, East Sussex. Gillian explains – ‘We met at University and after 11 years together it was becoming a bit of a running joke with our friends that we were still unmarried, so it was the biggest shock when Nigel finally proposed! ‘Having waited so long to be asked I wasted no time in planning the big day. I became slightly addicted to buying wedding magazines and these were really helpful in providing ideas and inspiration. 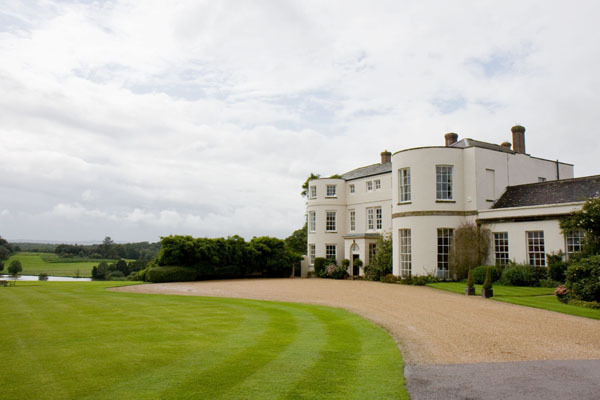 ‘We looked at a couple of venues but we fell in love with Newick Park the moment we arrived. It was exactly what we wanted, it fitted the bill perfectly. A fabulous property with wonderful staff and just enough bedrooms to ensure we had exclusive use for our wedding. ‘Nigel and the boys took themselves off to the racy location that is The Isle of Wight. They went for a long weekend which was full of the typical stag activities and the bonus of a win in the Prince of Wales meat raffle! ‘Our hopes of an outdoor wedding were well and truly quashed by the wettest September weather for quite some time. We were lucky that the venue had a lovely Library which was perfect for our ceremony. ‘I wanted a dress that suited an elegant wedding and once I’d tried a Caroline Castigliano dress and felt the beautiful French silk, nothing else was going to do. It’s important that a bride feels special, and you do every step of the way with Caroline Castigliano. As the bridal gown had a green sash we had a Watters bridesmaid dress made in a matching green with an ivory sash. ‘As we were hoping to have an outdoor ceremony we booked a string quartet for the ceremony and to play until we sat down for the wedding breakfast. It was nice to have something special and kept our guests entertained while we were having photos taken. ‘During the meal, try to go together as bride and groom to each table to speak to your guests in stages - it’s a great way to make sure you speak to everybody.